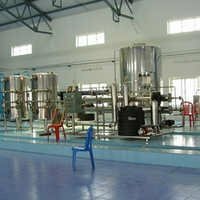 We are a reliable business entity, engaged in providing extensive array of mineral water ro plant, mineral water bottling plant, and mineral water treatment plant to our clients in a stipulated time period. Our range of water treatment plants are best known for operational fluency, low maintenance, easy to install and the likes. These are designed and fabricated under the strict vigilance of professionals using optimum quality raw material, obtained from trusted vendors of the industry. Due to the attributes like robust construction, low maintenance cost and easy to clean properties, these industrial RO systems are broadly acclaimed in this highly competitive market.